Hoaxes and dictator’s lies are real, they don’t need an allegedly or questioning. Just two weeks after ABC News embarrassed itself by interviewing alleged hate-crime hoaxer Jussie Smollett without any questions regarding the implausibility of his claims, the media outlet has done it again. ABC’s Tom Llamas flew to Venezuela to interview Dictator Nicolas Maduro and gave the leader free rein to lie about America without any tough questions and very little pushback. 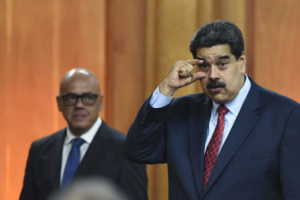 “Tonight, the tension building in Venezuela’s power struggle. Aid trucks set on fire over the weekend, as opposition groups tried in vain to bring over much-needed food and medical supplies, donated by the United States. Tonight, in a rare interview inside of his presidential palace, Nicolas Maduro telling ABC News he believes the U.S. is preparing a military invasion to get him out,” Llamas, a correspondent and weekend anchor, said at the beginning of the broadcast.